Lotsa links, and looks to be what appears a comprehensive summary of the current amendments. This article, from the Washington Post, is quite lengthy, but it does a great job of trying to quantify the actual costs of health care – the costs that seem to be lost on many. It uses the Kaiser Foundation’s 2009 Employer Benefits Survey as its basis. Most people recognize the Henry J. Kaiser Family Foundation as a well-respected, non-partisan source for health insurance and health industry analysis. The Kaiser Health News is a daily must-read for me, and I’ve had a link up over there under “Citizen’s Info” for quite some time. Sen. Tom Coburn (R-OK) has proposed a five-member Health Care Services Commission and an Office of the Forum for Quality and Effectiveness in Health Care (how’s that for panels, folks? ), which would be appointed by the President and approved by the Senate. What do you think is meant to happen when those panels and commissions come to the conclusion that certain things aren’t covered, or aren’t reimbursed enough? Coburn’s proposal mirrors what happened in the House for HB3200 – Republicans offered up amendments at the speed of sound that added cost and expanded both coverage and oversight. That’s what people call “making sausage.” Now the key is to keep track of what’s going in – and as one person I know recently noted – keep the pig’s ears and other undesirable parts (he used other words) out. Of course – he was saying that they already went in to the Baucus bill and it’s hard to get ’em out…. It was only a matter of time till Baucus heeded the deadlines that President Obama and Majority Leader Harry Reed set out, and dumped his bill into the Finance Committee. In an 18 page press release (didn’t anybody ever teach these guys PR 101), Max outlined the framework of his bill. You also can read the Chairman’s Mark, if you are so inclined to sift through the 223 page Mark. I’ve often said that Max Baucus positions himself in the middle of a legislative battle in such a way that he gauges the success of his compromising by the degree to which he offends the most people on both sides of his position. To that end, I’d say that Max must be celebrating a huge victory tonight, as it seems that he has not been able to garner any positive political support from either democrats or republicans. What did HCAN! have to say about Baucus’ bill today? “The Baucus bill is a gift to the insurance industry that fails to meet the most basic promise of health care reform: a guarantee that Americans will have good health care that they can afford. The Baucus bill would give a government-subsidized monopoly to the private insurance industry to sell their most profitable plans – high-deductible insurance – without having to face competition from a public health insurer. Under the Baucus bill, employers would have no responsibility to help pay for their workers’ coverage and would be given incentives to have workers pay more for barebones insurance. Americans who don’t get health benefits through work would still not be able to get good, affordable coverage. So now that Max has failed at appeasing the GOP in an attempt to secure at least one vote (after he had crowed about getting 75-80 senators to sign on to his efforts), it appears that his bill will have to undergo a severe transplant in order to make it out of the Senate Finance Committee, and for the Senate to move forward. In other news, the stock market took kindly to the Baucus/Wellpoint bill with a 3% surge in health insurer stocks on news of the bill’s release. Quid pro quo at its worst. Is it Baucus’ “Wellpoint Plan”? 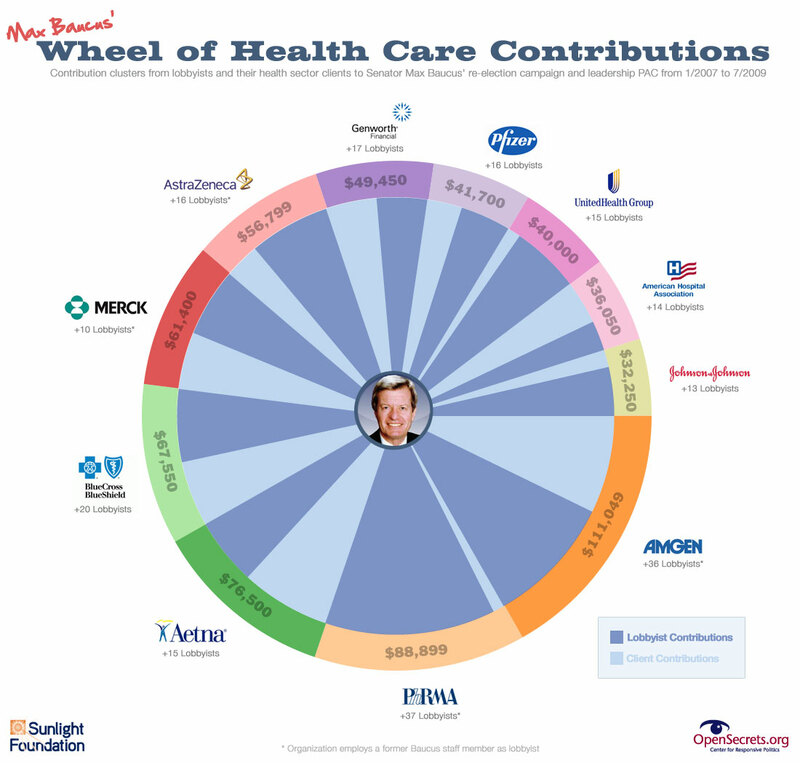 or is it Wellpoint’s “Baucus Plan”? It seems that Senator Max Baucus’ “Wellpoint Plan” has hit a snag as his framework was released yesterday, in a last ditch effort to recapture the limelight and lead on health care reform. If Fowler did indeed write the draft plan, then how did the same framework and language find its way into an amendment submitted by Blue Dog Mike Ross in July? Jane puts together an excellent timeline showing how the behind-the-scenes charade was conducted. Interstate Sale of Insurance. Starting in 2015, states may form “health care choice compacts” to allow for the purchase of non-group health insurance across state lines. Such compacts may exist between two or more states. Once compacts have been formed, insurers would be allowed to sell policies in any state participating in the compact. Insurers selling policies through a compact would only be subject to the laws and regulations of the state where the policy is written or issued. This is something that conservatives have been begging to do for years. Even the most outgunned conservative on a talking head debate can vomit up “let people take their insurance across state lines to increase competition!” It sounds reasonable. But there’s a very good reason why it would quickly turn into a nightmare, and you can see it in the examples of Delaware and South Dakota. Both of those states have essentially no regulations on credit card companies. When legislation passed allowing banks to issue credit cards across state lines, some states started wildly deregulating their credit card markets in a race to the bottom. South Dakota and Delaware won. And now practically all credit cards are issued from those two states. So not only is Max doing Wellpoint’s dirty work, he is giving the republicans a dearly sought-after concession. And just what has he gotten from republicans for that bone? As far as I can tell, nothing. Not even one single republican agreeing to sign on to his framework. I’m sure we’ll have more details as this story unfolds in Baucus’ haste to sell out become relevant again. Hope that’s all crystal clear. And this is the guy who was supposed to reform our health care system? Take a look at the document properties of the pdf that ew links to above. The author is Liz Fowler. The Liz Fowler who was vice president for public policy and external affairs for Wellpoint, the nation’s second-largest health-insurance company, until she re-joined Baucus’ staff in Feb. 2008. She had done an earlier stint with Baucus from 2000-2005. It seems that the pdf that Baucus just released with his 18 page framework for health insurance ‘reform’ lists Liz Fowler as the author. Liz Fowler, as some know, was the staffer that left Baucus’ office in 2005 to pursue a stint at Wellpoint. Whereupon she returned and was tasked with pushing current reform efforts through the Senate Finance committee. This is an egregious example of the revolving door in D.C. that is emblematic of the corrupt, corporate, big money morass that has become known as our current Congress. Not only does our senior Senator wash himself in corporate and lobbyist health care dollars, he takes on one of their own to write his legislation for him, and to assist with a backdoor PR campaign to push Congress in his direction. Obama to Attend Baucus Fundraiser at the Yellowstone Club? Obama’s visit could be a real opportunity for the Tea Party to get more exposure, [steering committee member Bob] Adney said. Talk about stumbling off cliffs. Obama, that is. Remember Billy Tauzin? Onetime republican rep from Lousiana, and as recently as 2004 chairman of the House Energy and Commerce Committee now headed by Henry Waxman? The last House Committee to report out a healthcare bill last week? Yah, that Billy Tauzin. The Billy Tauzin who pushed the Medicare bill through Congress that diverted billions to pharmaceutical companies? The Billy Tauzin that left Congress from his position of regulating pharmaceuticals to being their chief lobbyist? Yeah, that Billy Tauzin. So Obama brought Tauzin in, roughed him up a bit, then offered him a deal, and “directed him to negotiate with Senator Max Baucus, the business-friendly Montana Democrat.” The business friendly Montana Democrat! How about that!! Max, the $750,000 recipient of donations from the pharmaceutical industry. Talk about a couple of foxes guarding the henhouse! Well, now we know why healthcare reform, Max-style, is a done deal. A deal with the devil. The administration found themselves a nice paid-for shill already in the pocket of PhRMA to go and offer the industry a little bit of protection in order for some concessions. I think I’m starting to get the feel for what “politics, Chicago-style” is all about. Just a little back story for you all about the upcoming Obama/Baucus summit in Bozeman. Cat’s out of the bag…way out of the bag and running down the road like its tail is on fire, so what the hell. 4&20 hears, via 3,000 emails, tweets and phone calls that Obama’s coming to Bozeman on August 14th, with his lovely wife Michelle, to attend a town hall meeting at an airport hanger and then head down to Big Sky to meet with (at least) Senators Max Baucus and Jon Tester for the weekend. That’s all I got, but there it is. Well…came across a National Journal article that links to a Great Falls Tribune – John S. Adams news article on Sen. Baucus’ annual Big Sky retreat for health care sector lobbyists. That’s no joke, people – Montana’s senior Senator actually hosts an annual fling-ding in Big Sky specifically for lobbyists from the health care sector. Pretty unreal. Nice to see, though, national media taking notice of Montana’s fine journalists. Bozeman Chronicle had an article recently on the big Hebgan Lake earthquake of 1959. All that geology stuff fascinates me and I’ve read a good bit on that event, but I don’t ever recall hearing that a kid survived the boulder-smashed-a-tent story. The 50-year anniversary is coming up: August 17th. In last V&S I mentioned ex-health insurance executive Wendell Potter – well, this week the UK’s Guardian did an interview with him. Fascinating view of our fabulously wonderful American real world health care system. Bozeman’s spending $10,000 to hire a Missoula investigator to look into the who what why when of the City’s requirement that job applicants had to provide their facebook/social networking site passwords…and email and banking information, too, apparently. That really is an incredible situation. How could someone even dream that up, yet alone implement it? So I guess it’s all good – The Lawsuiters hire a Bozeman attorney and the City of Bozeman hires a Missoula investigator. I want to remind everyone that August 10th is the deadline for submitting public comment to FWP about their plans to electrify numerous state park campgrounds. Comments should be directed to Lee Bastian by phone to 406-542-5517 or emailed to lbastian@mt.gov. Today’s the first of the month – get it done and tell a friend. Oh – how about this one: NY’s Attorney General is looking into 9 banks that needed and took the most bailout money, and still handed out minimum $1,000,000 bonuses to 5 THOUSAND employees. When you read how much these guys lost to earn that kind of bonus, it makes you kind of sick. Ward 1 Councilman Dave Strohmaier has invited everyone to the Greenough bridge restoration fundraiser. It’s today, from 3 – 5 p.m. at the picnic shelter.